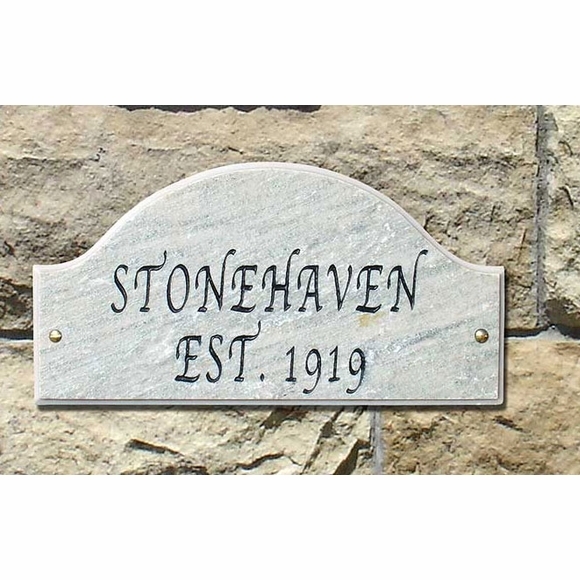 Granite 2 Line Arch Address Plaque with Fancy Font - - Custom arch shape solid granite address plaque features a fancy italic-style font which differentiates it from most other plaques. Holds two lines of personalized text with up to 15 characters (including spaces). Characters are generally 2.5" high. Quartzite color plaque with your choice of four text colors: black, white, mocha, or gold. Mounting hardware for wall installation included. Optional lawn stakes sold separately, item 71731F, see Related Products area at right.